“I was always going for the win, but I wasn’t sure I could beat Lorenzo – I’m not always super-fast with Clooney and Lorenzo looked really fast on the screen. I didn’t know what time I had going through the finish, but when I looked up I saw first place and I was very, very happy,” said Fuchs. 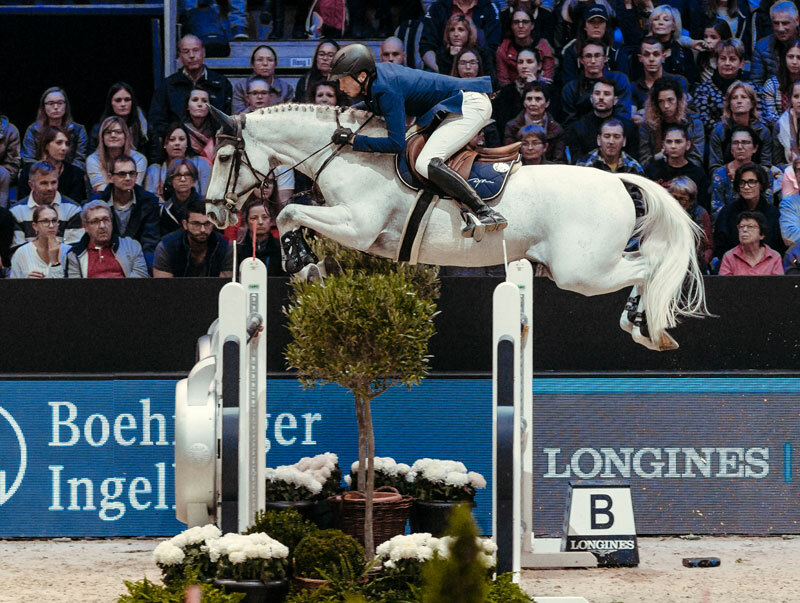 With a third-place finish last weekend in Verona, Italy the Swiss rider now heads the Western European League table carrying a handsome 35 points, so only needs a few more to book his ticket to the Longines Final in Gothenburg, Sweden next April. French course designer, Gregory Bodo, gave them plenty to think about in today’s first round in which the 75 seconds time-allowed proved highly influential. “With the top riders and horses present it’s not easy to find the right balance, but the time was perfect and riders had to keep the right tempo from the start to the end to be in time” he explained. Italy’s de Luca really put it up to the rest of them in the jump-off when stopping the timers in 37.78 seconds with a great run from his powerful 14-year-old gelding and, with just three left to go, Dutchman Maikel van der Vleuten was his nearest rival after posting 38.00 with Dana Blue. The 7,000-seater stadium was packed with French fans who held their collective breath as Staut set off with For Joy van’t Zorgvliet, but despite their best effort the pair didn’t threaten the lead when breaking the beam in 38.32 seconds. Second-last into the ring however, Fuchs had his foot to the floor all the way, and with a brilliant turn to the vertical three from home and a breathtaking gallop to the last, he stormed through the timers in 37.25 seconds and not even Guerdat and his brilliant mare Bianca could match that. De Luca held on for runner-up spot while 2012 Olympic champion Guerdat, twice-winner of the Longines FEI Jumping World Cup™ title, had to settle for third when stopping the clock on 37.89. “Clooney had a one-month break after Tryon (FEI World Equestrian Games) and then we came to Verona and Lyon because I really want to qualify for the Final. I’m going to Wellington (USA) in January so I wanted to focus on the World Cup qualifiers now” Fuchs explained this evening. He’s had an extraordinary year with the horse he competed at the Rio 2016 Olympic Games and with which he claimed two European team bronze medals, in 2015 and again in 2017. They kicked off 2018 with 5-Star Grand Prix wins at Basel and Zurich (SUI) but Clooney then had to undergo colic surgery in April and that was a worrying time. He bounced back however and, just a few weeks after claiming World Championship individual silver, the grey horse is continuing to show incredible form. “He’s such a tough horse, he always fights. When I got him in the beginning I was struggling a lot because he has his own mind and he’s so strong. But over time we have come to work really well together, and now we can do anything,” said Fuchs.